Chiang Mai airport (CNX/VTCC) was established in 1921 as Suthep Airport. 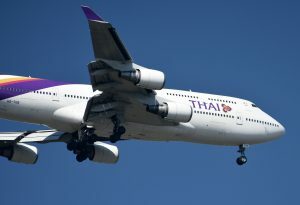 As a result of the temporary closure of Suvarnabhumi Airport in 2008 due to the protests, Chiang Mai became the alternative stop-over for China Airlines’ Taipei-Europe flights and for Swiss International Airlines’ Singapore-Zurich flights in the interim. On 24 January 2011, the airport became a secondary hub for Thai AirAsia. Upgrades in 2014 included expanding the apron for larger planes, extending operating hours to 24/7 (effective April 2014), and enlarging the international arrival hall and domestic departure hall. The airport is at an elevation of 316 metres (1,037 ft) above mean sea level. It has one runway designated 18/36 with an asphalt surface measuring 3,100 by 45 metres (10,171 ft × 148 ft). There are two terminals, one for domestic passengers and the other for international flights. It is a single building with separate entrances and exits! Chiang Mai Airport web site.